Example of how to calculate total assets: If you are petitioning for your spouse, and the poverty line for your household size is $25,200 and your current total income (as indicated on your most recent tax return) is $23,000, the difference between your current total income and the poverty line is $2,200. Since you are petitioning for your spouse, the total value of the assets must equal three times the difference. Three times the difference would equal $6,600. You must supplement your income with assets that are equal to at least $6,600 in this case. For information regarding how to use the sponsored immigrant or household member’s assets please view the I-864 instructions. NOTE: The process of supplementing your income with assets can be complicated. You must read the affidavit of support instructions very carefully. It is strongly recommended that you enlist the help of an attorney to prepare your affidavit of support and include all of the necessary documentation. If you fail to provide the necessary documentation for your assets, you will likely receive a request for evidence. If you fail to provide the necessary documentation with the request for evidence, the application may be denied altogether and you will need to re-file again. Do not let this happen to you. Note: Sponsors on active duty in the U.S. armed forces who are petitioning for their spouse or child must use the 100% chart. for all other sponsors the 125% chart will apply. Consular Processing: What is it? How long does it take? Q: I am an American citizen. I want to bring my wife and step-son to the United States. What is the process? How long does it take? A: The process will depend upon whether your wife and step-son are residing abroad or residing in the United States at the time of filing. If your wife and step-son are residing abroad, they will be subject to immigrant visa processing at a U.S. consulate abroad. This process is commonly referred to as ‘consular processing.’ To start the process, you must first file the I-130 petition for both of your relatives. It takes approximately 3-4 months for USCIS to approve this petition. Once this petition has been approved the applications will be forwarded to the National Visa Center which may take an additional 30-60 days. Once NVC has received the applications, your relatives will be required to submit various required documentation to the NVC including civil documents, the DS-260 immigrant visa application, affidavit of support, military records, court and prison records, etc. Once you have submitted all of the required documents to the NVC it will take additional time for the NVC to complete pre-screening of the applications (typically an additional 30-60 days). Once pre-screening is complete the applicant must wait for an interview notice from the U.S. Consulate or Embassy nearest their place of residence. The interview notice is typically sent my electronic mail. Once the interview notice has been sent, the applicants must prepare and gather all necessary documents for the interview. This will require applicants to undergo a medical examination. Consular processing may take anywhere from 7-12 months depending on the volume of applications at the NVC at the time of filing and the US Consulate/Embassy where the interview will take place. For more information about the NVC process please visit our website. Is Joint Sponsor debt a problem for the Affidavit of Support? Q: My husband does not earn enough money to sponsor my application for permanent residence, so my nephew will be my joint sponsor. He has many student loans that he has borrowed from the government. We would like to know if this will affect his ability to be my joint sponsor. A: Thank you for your question. As long as the joint sponsor meets the income requirements based on his total income and household size, his student loans will not be a problem for the purposes of filing the affidavit of support. His debt will not factor into the affidavit of support question. Q: I am a US Citizen living in the United States. My wife is a foreign national living and working abroad. We were recently married February of this year. My wife would like to obtain the permanent green card directly (10-year green card). She does not want to obtain the conditional (2-year) green card that requires her to remove the conditions by the end of two years. What can we do? A: This is a very interesting question, without an easy answer. 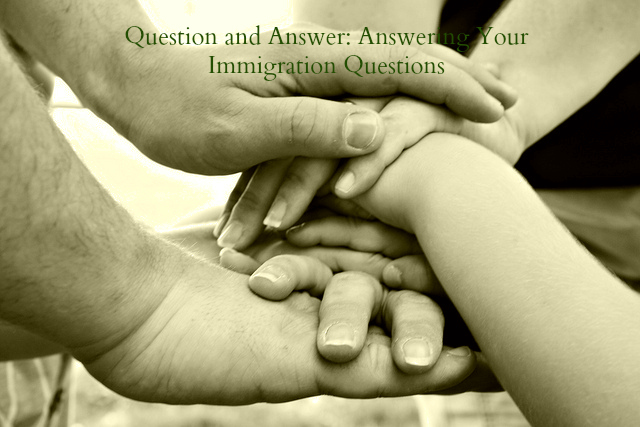 Typically, there is no way to get around the issuance of the conditional green card if your marriage is less than 2 years old on the day the intending immigrant has been approved for permanent residence. The key here will be to time the filing of your application such that on the day your wife goes to her interview and is approved for her immigrant visa, your marriage has been more than 2 years old, so that she may receive the permanent ’10-year’ green card when she arrives to the United States instead of the conditional green card. You have stated that your wife is living and working abroad, therefore she will be required to undergo ‘consular processing’ to obtain an immigrant visa to travel to the United States and subsequently obtain her green card. Consular processing is a very length process, taking anywhere from 7-12 months depending on the volume of immigrant visa applications the NVC is processing and the place where your spouse resides. The problem is that it is very difficult to predict the processing time for consular processing. The time it will take for the immigrant visa interview to take place depends on many different factors that are largely out of your control. For example, as part of consular processing, your wife’s application will pass through USCIS, then the National Visa Center, and finally the embassy where your spouse will have her immigrant visa interview. The time it will take for these entities to process your wife’s application will depend on their individual work load at the time of filing. There can be no guarantee of exactly how much time it will take. You can only be given approximations. To make absolutely sure the date of your marriage is more than 2 years old at the time of the interview, you should probably file when your marriage is at least 1.5 years old, since consular processing at minimum takes 7 months. This will ensure that she will not attend the interview when your marriage has been less than 2 years old. Q: I am currently on an H-2B visa and have a SSN. Can I obtain a driver’s license? In order to obtain a driver’s license, you must have a valid United States visa and a valid I-94 arrival/departure record. The DMV typically issues driver’s licenses based on the duration of stay indicated on the I-94 arrival/departure record. If your duration of stay has been extended by your visa you must present an official government document indicating your authorized length of stay such as your original final NOA receipt notice containing your new I-94 at the bottom of the notice with your expiration of stay.